THIS DAY IN RMR HISTORY: “Since their departure from the Dominion the Canadians have earned the reputation of being prolific letter writers. British post office men said that they had never seen such a lot for letter writing. 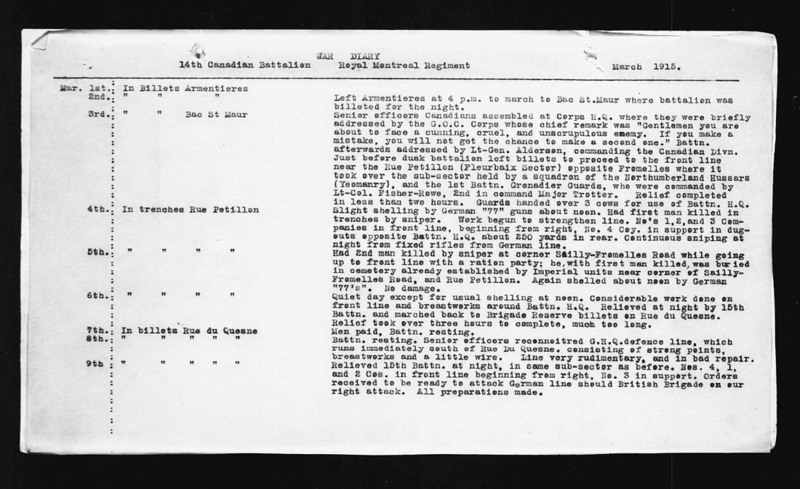 The Canadians apparently have continued the practice since their arrival in France, judging by the amount of stuff that the censors have been called upon to handle. The other evening the censor attached to one of the Canadian units had a regular raft of stuff to look over and much of it had to be withheld. One of the Canadian boys in a letter addressed to relatives in Canada had mentioned everything that had happened from the time they left England until they reached northern France. Next morning when the men were on parade the officers returned the letters to them with the explanation that they contained too much military information to pass the censor. The officers were very nice about it, explaining to the boys what they could send and what they must not send. “Canadians Welcomed by British Regulars,” William Marchington, The Globe (1844-1936), Toronto, Ontario, Thursday, March 4, 1915, pg. 7.